STCP hydrogen-powered bus, June 2005. Above, left: STCP MAN City Gold 2KC NG and, right, STCP Mercedes City Gold bus 2142 at Largo do Viriato, July 2001.. 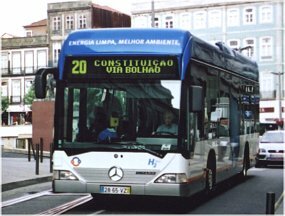 The city's municipal bus operator is STCP (Sociedade de Transportes Colectivos do Porto), whose web site is an excellent resource for the visitor. STCP grew out of the CCFP (Companhia Carris de Ferro do Porto) in 1946. STCP's first buses were delivered in July 1947 at a time when they were seen as an improvement on the ageing STCP tram fleet. Moreover, the electric power supply for the trams was unreliable in the 1940s. 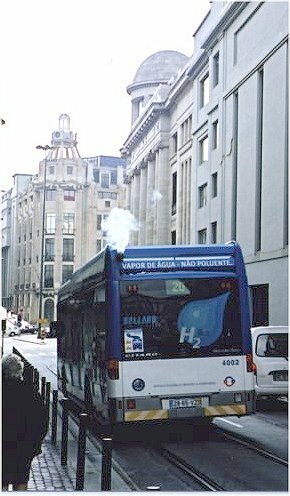 With just two vehicles at its disposal, the company started bus services on 1 April 1948 on service "C" between the Avenida dos Aliados and Carvalhida. Until the late 1990s STCP ran both trolley-buses and conventional motor-buses. Indeed, the trolley-bus fleet comprised both single- and double-deckers. Today the bus-fleet entirely comprises single-deck vehicles but, innovatively, a significant number of these are now gas or hydrogen rather than diesel powered. STCP's three hydrogen-cell buses are part of the 10-city wide CUTE (Clean Urban Transport for Europe) programme; the buses cost 1.2 million Euros each, nearly five times as much as conventional vehicles. Right: Amongst the most innovative transport sights in Oporto are the hydrogen-cell powered buses, of which three are on the streets as part of Europe-wide trials. Water vapour is exhaled from the vehicles above the rear window, as is clearly seen in the adjacent photo, taken in June 2005. Volvo-powered vehicles (B10R and other B10 variants). Mercedes-powered vehicles, built by Caetano and branded as City Gold MB2 KD. For visitors a good option is the Euro ticket (above). The card costs one Euro and can then be charged up for various amounts. 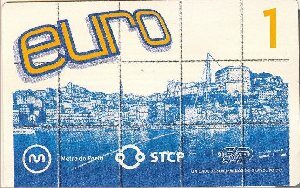 The ticket can be bought at Metro and STCP offices including opposite the latter's opposite São Bento railway station. The tickets must be validated for each journey by holding in front of a machine on each vehicle.